EN Historie | Goldschmiedehaus Hanau - Gesellschaft für Goldschmiedekunst e. V.
Located in the heart of Hanau's historic district, the German Goldsmiths' House was built as the city hall on the Altstädter Markt in 1537-1538 in the style of the late Renaissance Period. The exterior appearance of the house was altered in 1768; the oriel windows were removed and the half-timbering was plastered over. When the Old Town and New Town were consolidated in around 1820, the city administration moved to the new city hall which had been built in 1730. The building on the Altstädter Markt could then be used for other purposes. 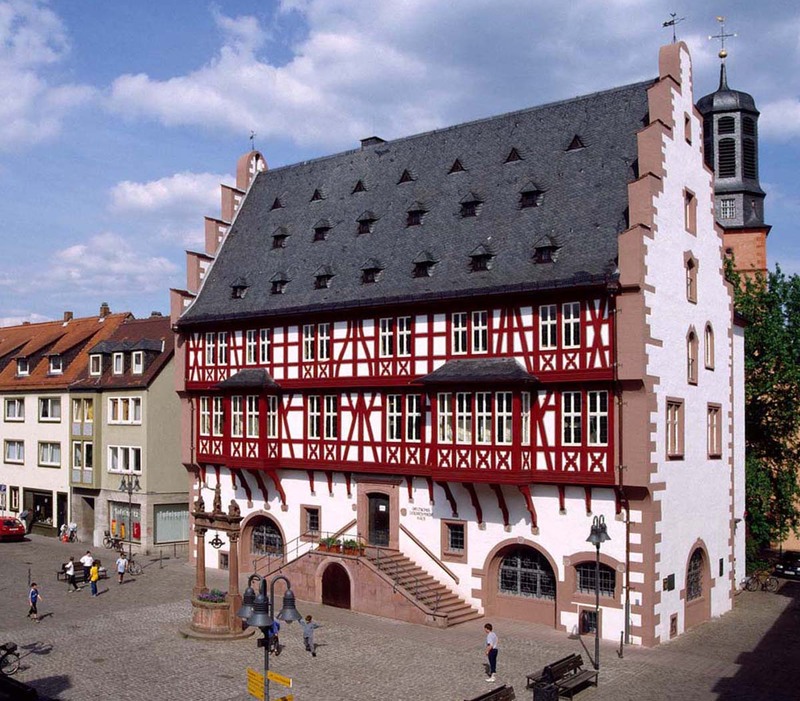 From 1821 to 1850, it housed the Regional Court of the Electorate, then it became a middle school for boys, and in 1902 the Hanau Historical Society established a museum there. In 1942, on the urging of the Berlin jeweler Ferdinand Richard Wilm, founder of the Association for Goldsmiths' Art, the building became the German Goldsmiths' House to be used as an exhibition site for gold- and silversmiths' art. The war destruction of March 1945 made the Goldsmiths' House no longer usable. However, by March 19, 1958, the Goldsmiths' House had been rebuilt in all its original glory as a half-timbered building and ever since has been able to function again as an exhibition house for jewelry, hollow- and flatware. There followed further alterations and new construction work have made the house an attractive exhibition site. With its regularly changing exhibitions in the Gold and Silver Halls of nationally and internationally known artists in the field of jewelry, hollow- and flatware design, as well as on historical jewelry themes, the German Goldsmiths' House offers an opportunity to repeatedly become acquainted with new aspects of gold- and silversmiths' art. In the historical workshop in the basement, the visitor can familiarize himself with the workplace of the goldsmith. Supplementary presentations demonstrating various specific techniques, goldsmith workshops for children, guided tours for the public, as well as lectures compliment the offer.